No stranger to collectors, Barry Sanders is one of the most accomplished players in league history and appeared certain to break the all-time rushing record until his abrupt retirement. 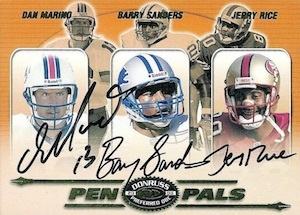 While it is fair to wonder how much greater Sanders could have become, he still did plenty in his ten seasons and is easily one of the most popular former NFL players in the hobby. 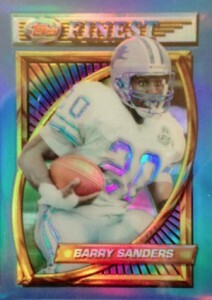 The following guide looks at some of the top card options for Barry Sanders. Given the sheer volume of cards available for Barry Sanders, the overall purpose of this list was to identify a good mix of options across all budgets and collecting periods. 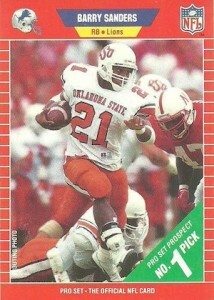 Clearly there are many other great Barry Sanders cards not mentioned on this list. 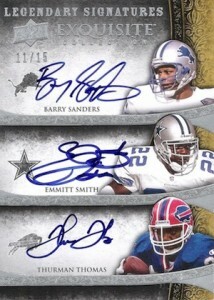 Let us know your favorite in the comments or feel free to mention the top Barry Sanders card in your collection. 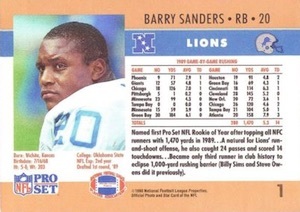 While it is not an official rookie card, the oddball Barry Sanders release from the Detroit Police Department is a popular choice for collectors. The narrow card was part of a 12-card set sponsored by Oscar Mayer and Claussen and values can push into the hundreds for high grade cards. 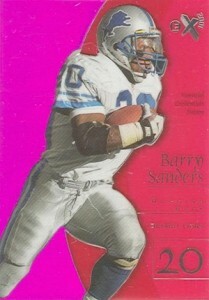 One of the three true Barry Sanders rookie cards, 1989 Pro Set has aged the worst. The orange color, college image and lined border combine to make a card that is unlikely to impress. 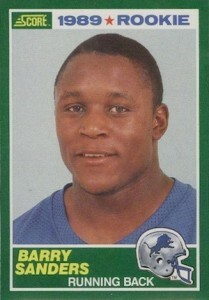 However, the card will always maintain interest based on the fact that it is a Barry Sanders rookie card. 1989 Score is the place to find the top rookie card for Barry Sanders in terms of value and the green-heavy design still works today. The card stands out among the three because it is the only one to feature Sanders in a posed image. A BGS 10 version sold for $1,275 in December of 2014. 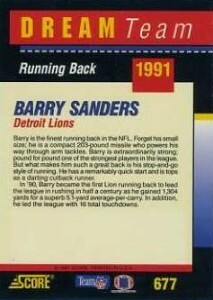 The final Barry Sanders rookie card came in the box set update to 1989 Topps. 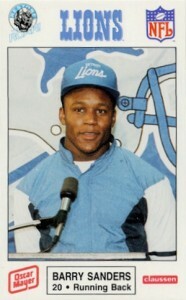 The simple design and Detroit Lions uniform make it arguably the best overall Barry Sanders rookie card for collectors. For most collectors, Pro Set is indicative of the period defined by huge print runs and low values. While this is largely true, there are exceptions. 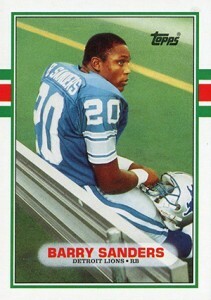 One of these is a limited variation for Barry Sanders from the 1990 Pro Set. The rare promo was originally issued at the Hawaii Trade Show Conference and can be easily distinguished from the base card by the image on the back. The regular version shows Sanders hoisting the Rookie of the Year trophy. Also, the promo card does not display "THE OFFICIAL NFL CARD" on the top part of the gold border on the card's front. 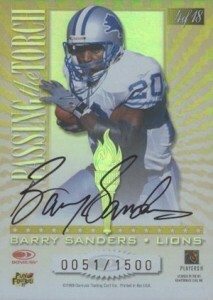 One of the earliest Barry Sanders autographs, this card rarely surfaces and has long caused headaches for collectors. The base version, shown second, is very common and displays a facsimile autograph on the back. The signed version, reportedly limited to 500 copies, is signed on the front and a blank spot replaces the facsimile autograph on the back. Part of the Refractor revolution that would become a fixture of the hobby, 1994 Finest is a terrific option for collectors. The loud Barry Sanders parallel card is rare enough to yield a premium but is still affordable for most collectors. 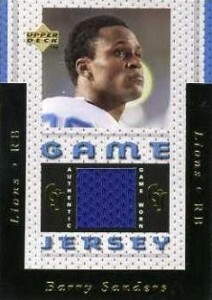 While collectors can find game-used football relics for Barry Sanders in 1996 Collector's Edge Advantage, the first game-used jersey card for Sanders came in 1996 Upper Deck. Most would think little of the small jersey pieces now, but at the time, these cards were very notable and strong values follow whenever they surface. Already one of the most distinct brands from the history of the hobby, E-X also introduced Essential Credentials parallels. 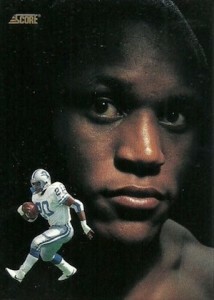 1997 and 1998 are both very popular editions for Barry Sanders collectors. In addition to the 1998 Future parallel shown below, there is also a Now version that is limited to just five copies. The PMG craze never reached the same heights in football as it did for basketball collectors, but the foil-covered parallels are still an appealing option. 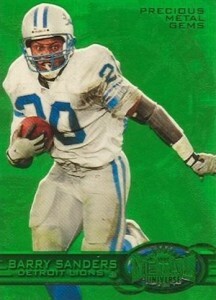 There are 150 total cards for Barry Sanders and the first 15 are green, while the remaining 135 are red. Celebrating two of the greatest running backs in NFL history, this signed card for Barry Sanders and Walter Payton is a piece of sports history. While the print run of 1,500 might seem high, only the first 100 were actually signed and the remainder were issued as an unsigned insert. 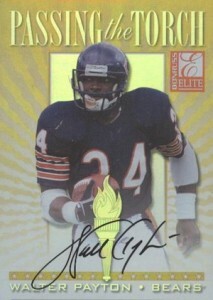 Although sticker autographs became the norm for most products during the 2000s, premium releases brought the on-card autographs back to collectors. 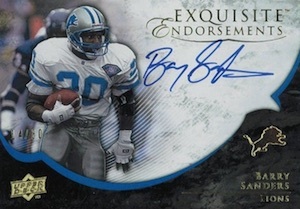 Exquisite Collection is one of the most popular choices and presents several low-numbered options for Barry Sanders. 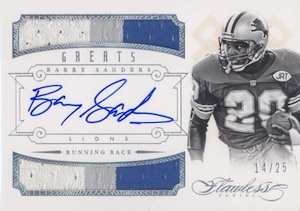 Another top modern collecting option for Barry Sanders, Five Star brings a quality design, on-card autograph and manageable print run. 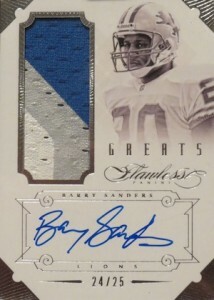 The most current cards on the list, Flawless features all the hallmarks of a premium release for Barry Sanders collectors. Part of the Greats insert line, there are two versions, each numbered to 25, that feature a patch piece and on-card autograph. 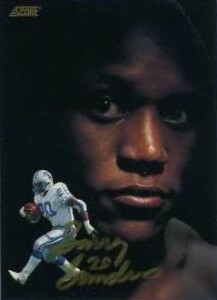 In addition to his many single-player cards, Barry Sanders is also a popular option for dual, triple, quad and other multi-player autographs. 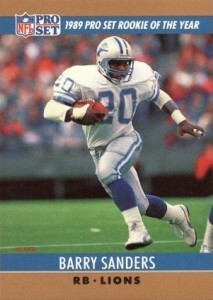 Sanders is frequently paired with other Hall of Fame players, especially running backs, and these limited cards can produce some of the highest total values. Check out the available options by clicking the images or the listing. 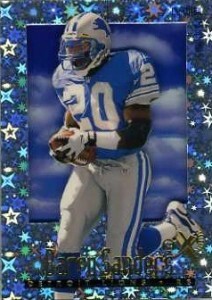 i have a Barry sanders rookie and am trying to find the value of it and where I could go to sell it. Hi noticed on the 1991 pro set gazette inserts it mentions redemption cards for the all-star cards #d to 25, do you know if these exist, can’t find any info on these cards at all. 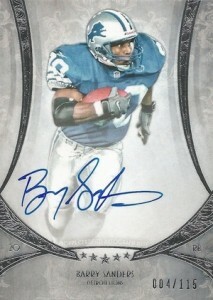 Have rookie cards,wild cards,league leaders,rushing leaders,etc. Need accurate prices an possible buyers. Thanks. I actually have all 4 of the listed Barry Sanders RC’s including the Oscar Meyer. How much would the complete set of the 4 be worth? Actually have multiples of the score and proset versions.